Do you all remember Dr. Katz, Professional Therapist? It was that show with the very poor animation and squiggly lines, called Squigglevision, that showed up on Comedy Central like ten years ago or so. I had caught a few episodes, but didn't really care for it. Well, now there is a DVD called The Best Of Dr. Katz , so I figured why not. I mean, who knows, perhaps the few episodes I caught just happened to be the bottom of the barrel... kinda like what happened with my first introduction to Spongebob Squarepants. Once I saw the good episodes of Spongebob, I totally got addicted! Will it be the same with Dr. Katz? Unfortunately, nope. Even the best of episodes are boring as hell. 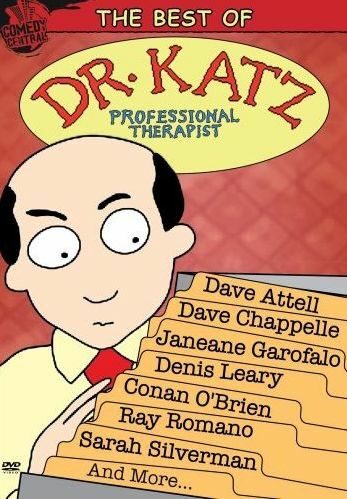 The premise of the show has a therapist named Dr. Katz treating patients, which basically involves him sitting there looking bored while the patient talks about their life or whatever else they want to talk about. The patients are always celebrities, and most of those are comedians, so it's kinda disappointing that this isn't funnier. This is especially true considering some of the names that show up, like Conan O’Brien, Dave Chappelle, Ray Romano, Kevin Nealon, Patton Oswald, and many others. That's not to say every single bit falls flat, because there are moments of hilarity, but there are just way too many duds to make this entertaining. And actually, the two other show regulars, Dr. Katz son Ben and his receptionist Laura, are funnier than most of the therapy sessions. They don't show up much in the episodes picked for this DVD, though they do have screen time once you make your way to the extra features, with the Dr. Katz Remembers episodes. Other extra features include some short clips from other Comedy Central shows, The Daily Show, The Colbert Report, South Park, and Reno 911. Then there are also some previews for TV Funhouse, South Park Season 11, and The Best of The Colbert Report. None of those actually add much to the value of this release. So mostly boring with poor animation, annoying Squigglevision, and few redeemable extra features makes this a disappointing DVD.